Glass splashbacks needn't be confined to just the kitchen or bathroom. Glass decor panels can look equally stunning in any living space and give that area a spacial appearance. Whether you want a glass decor panel as a backdrop to your flat screen television or to top off a wooden sideboard, Splashbacks of Distinction are on hand to help. We can provide you with all manner of shapes, sizes and textures of glass in standard panels or bespoke shaped designs to enhance your living space and make it as unique as you. Let your imagination run riot and think about all the possibilities available to you. 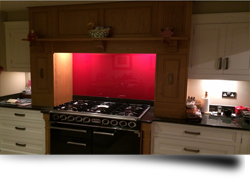 If you are unsure of what can be achieved, allow Splashbacks of Distinction to offer you their advice, we have been fitting glass panels and splashbacks for many years so you'll be in good hands. What could be more of a talking point than a stylish and chic glass wall covering? Wallpaper has never been so 'old hat'. A stripey Zebra design in glass can look very quirky when covering a feature wall and a simple decor panel in clear, coloured or textured glass can look extremely stylish behind your wall mounted flat screen television. There really is no limit to the possibilities. Call Splashbacks of Distinction today and we will astound you with the style and unique appearance that can be achieved with a glass decor panel to improve and enhance your lifestyle.